Shell has been given two safety warnings from the UK’s Health and Safety Executive (HSE) on its Lomond facility in the Central North Sea. Map of Lomond and surrounding Shell assets. Map from Chrysaor. Lomond is 145nm east of Aberdeen, in Block 23/21a at 83.3m water depth. According to the HSE, Shell has failed to maintain and test its plant and equipment; and has failed to implement a gas detection system. The reports states that Shell had failed to maintain the test and plan equipment, specifically the Erskine Process Module (EPM), High Integrity Protection System (HIPS), and associated valves to allow a full end-to-end test of the system in accordance with Shell’s maintenance and testing procedures. Failure to do so has proven Shell to be unable to demonstrate that the system is in effective working order. The HSE’s inspection found associated valves passing resulting in an inability to test the HIPS transmitters in situ; the last HIPS end-to-end proof test occurred in April 2014; and Shell’s procedures and performance standard require an annual test, in which the HSE said that it appeared to have only occurred once in over three years. Shell has a deadline of 31 August to comply with this notice. HSE’s second notice is for the Lomond’s gas detection system. The UK regulator said that the supermajor failed to install fixed point detectors in the EPM (specific areas are Main Deck East, West and East Mezzanine level, Upper Deck and Weather Deck) and the Lomond process Module (specific areas are Main Deck east, Intermediate Deck process West and Lomond Utilities), or provide adequate justification of their omission. “You cannot therefor demonstrate the adequacy of your fire and gas detection system of only line of sight detectors,” the HSE report states. Shell has until 29 September to comply with this notice. The supermajor confirmed to OE of receiving the notices on Lomond platform, which is currently shut down for planned maintenance, and said that the company is working to address the requirements. Lomond was a BG Group asset, which Shell acquired following the Shell/BG combination in 2016. Shell is the 100% owner and operator of the facility, however, the supermajor entered an agreement in January to divest Lomond in January, in addition to a package of its UK North Sea assets to Chrysaor for up to US$3.8 billion. 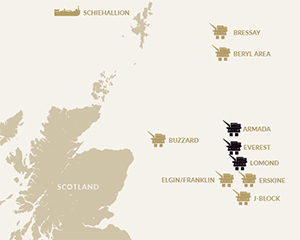 The entire package deal includes Shell’s stake in Buzzard, Beryl, Bressay, Elgin-Franklin, J-Block, the Greater Armada cluster, Everest, Lomond and Erskine, plus a 10% stake in Schiehallion. The deal is expected to close in 2H 2017, and is subject to partner and regulatory approvals. Unite the Union , welcomes the HSE inspections and more inspections should take place especially after it had come to light recommendations had not been implemented however it’s disappointing the UK Governments cuts in the public sector budget means cuts to staff and resource of the Health & Safety Executive (HSE) this puts offshore Oil & Gas sector workers at a higher risk as there are fewer inspections taking place in this high-risk hazard sector.